Despite Wednesday’s(3/25/2015) market weakness on virtually nothing but fear, there is plenty of technical action showing that markets appear fine. The question is how reliable is the action. Breadth indicators across multiple indices are positive. Small caps are leading large caps. Consumer discretionary to staples are favorable. Rate sensitive ETFs(TLT & XLU) have been conducting basic retracements which is perfectly natural coming off their hard sell-offs, but I think their selling will resume which will continue to indicate higher risk appetites once stocks take a little breather of their own. If the equity markets do what I think they’re going to do, which is correct a little harder here in the near-term, then I suspect TLT and XLU will chop for a bit while stocks let off of a little steam. Everybody has their own methodologies for reviewing the markets to get a feel for the probability of directional plays. I really like to use inter-market analysis to help me potentially sense where the greater market may be headed. I have been watching biotech very closely as it has been the hottest sector and a market leader for some time. Real weakness in biotech may be a precursor to overall market weakness. That action last week in IBB had me suspicious. To me it appeared to be a blow-off. Call it what you want, a throw-over or a bull-trap. Either way the price action raised my hackles and officially put IBB on my radar as a temporary short. Current price action in IBB and the S&P 500 may be proving that out. Now clearly, biotech is in a raging bull market and has been for several years now. You don’t want to fight that trend. It’s better just to ride it upwards for continued profit, because it’s going to take a lot more M&A in that sector before we see a top in biotech. However, there was a bit of froth in biotech M&A during the first quarter of 2015. Observe the following chart courtesy of Reuters and just look at Q1’s performance amongst pharmaceutical companies compared to the last 5 years. We haven’t seen that kind of aggression since coming off the lows of 2009. 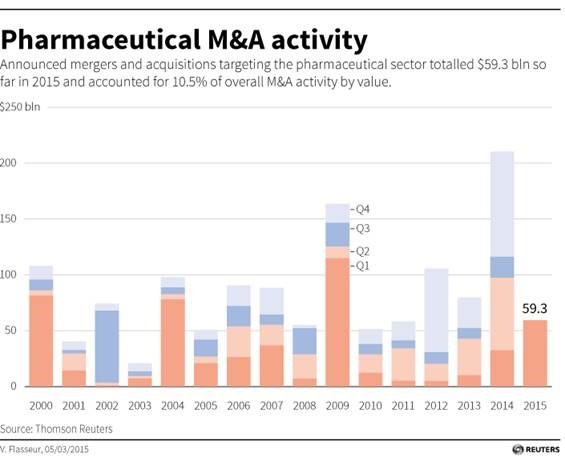 There’s been approximately $60B of M&A activity in pharmaceuticals to start 2015, which accounted for 10% of overall M&A activity in the quarter. Twenty-one billion alone of that $60B was done in the Pharmacyclics purchase by AbbVie. That also signaled to me a potential short-term top for biotech as J&J and AbbVie slugged it out for rights to the cancer-fighting company. So the real question then is how is this information actionable? Well that depends on your appetite for risk and how you’re looking to allocate capital in the short-term or long-term. If you’ve been visiting this blog for a while then you’re well aware I’m always ready to roll the dice based on my ability to interpret market action. I think shorting biotech via IBB or XBI is a good opportunity. I could have positioned earlier, but I was waiting for the price action to confirm so as to hopefully avoid being whipsawed. If any readers are inclined to risk come capital, I think that IBB’s price action has stated to market players that it looks good for a short-term short. A small bounce at this price point is likely; especially in light of that 4% down day. I suspect the bounce could move the share price back up into the $355 to $365 range giving weak hands sufficient room to liquidate. That liquidation could then kick off the next leg down in biotech. There is a very strong floor at $290 as that is where the current 50-month EMA rests, so any option players will want to factor accordingly. I’m not stating that I think IBB will definitely hit $290, just that it’s a strong price point of support. If IBB’s share price creates un-compelling options price points for smaller traders, then the XLV is a solid alternative. It has higher relative strength due to the size and various types of non-biotech holdings, but XLV possesses sufficient exposure to biotech that it will correct as well and it’s options may allow for a wider range of speculators to employ strategies. As for the larger market i.e. the S&P 500, I wouldn’t expect anything deeper than a 10% correction if even that deep. There’s strong support at its 50-month EMA, as well, which is currently at $1,987. A 10% correction would take us down to approximately $1,900, which is also a round-number “power line” that I see providing strong support. I also suspect that any sell-off would result in yet another V-shaped recovery so be prepared to remove any short bias as a new leg higher ensues for the S&P 500 and biotech. Remember, these are interpretations based on my inter-market analysis. There are plenty of breadth indicators putting a more positive spin on things. The markets are tricky, rigged, and no place for the ignorant. Manage your risks accordingly and utilize any potential correction to get long. There is continued quantitative easing on a massive scale across the world and the Fed is still reluctant to raise rates just yet. Current liquidity levels and yield curves continue to put a wind in the sails of higher risk assets. As Q1 draws to a close, take a moment to review your portfolio and see where you stand in 2015.